Enjoy a true sailing experience with a small number of passengers while sailing Hawaii in Kailua Kona! 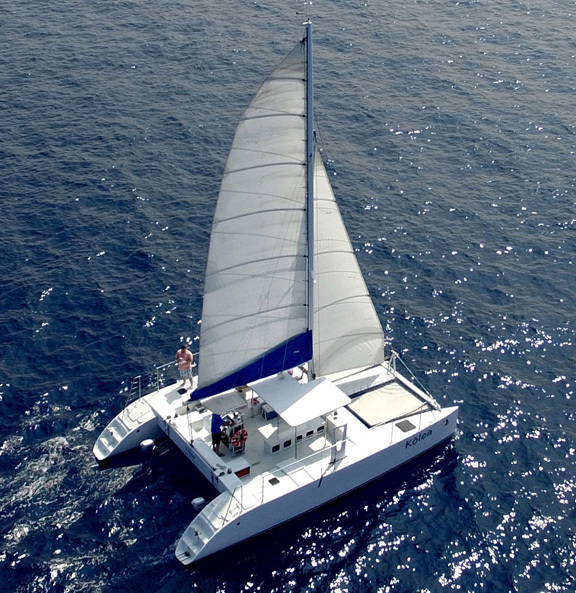 Our beautiful new sailboat features plenty of shade, comfortable cushioned seating with tables, nice clean toilet facilities and the roominess, stability and speed of the newest 36' sailing catamaran offering Big Island boat tours. We offer a variety of Kona sailing charters including a relaxing Kona Sunset Cruise and private catamaran charters for sailing, snorkeling, dolphin watching (*see notes below) and whale watching. Because we are family owned and operated, we provide the kind of personal service only a small business can and the comfort of catamaran sailing without the big boat crowds. Please check out our reviews on TripAdvisor to find out how much our guests enjoy sailing with us! and enjoy the beautiful Big Island Sunset. Have our beautiful sailing catamaran to yourself. Where to go and what to do is completely up to you! Snorkeling, Sailing, Sunset cruises, Dolphin & Whale Watching. Sailed twice this summer with Eric and Yumi on their beautiful catamaran (over July 4th and again over Labor Day). The boat is absolutely exquisite!